Have you ever wanted to grab all of your mismatched kitchen utensils, and throw them all away? Start over with ones that match? I never have until this week. 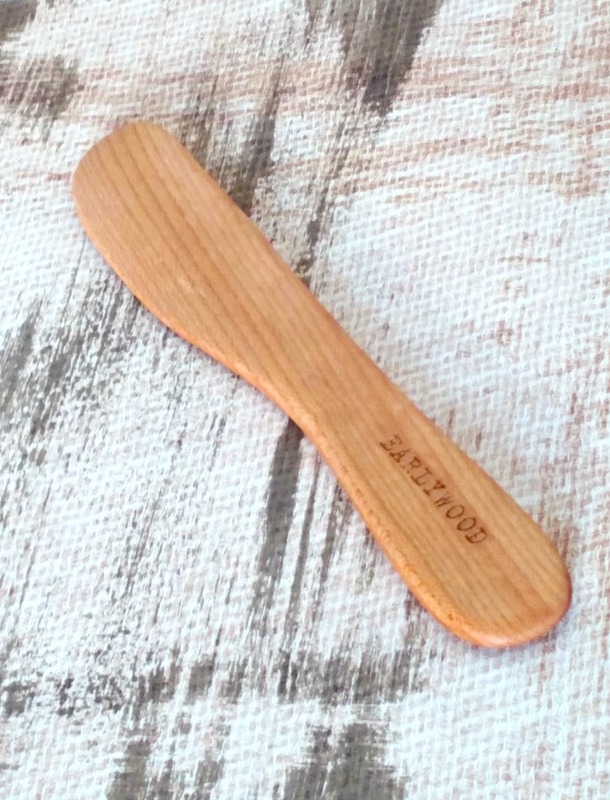 I was sent a set of Earlywood's utensils for review, and have fallen in love. This is NOT an exaggeration. You won't understand what I mean until you've held them in your hands. As I was looking for companies whose products were made in the USA, I stumbled upon Earlywood. If you're anything like me, you see a product, think it might be nice to introduce yourself to them, and see what you think once you experience them. I can't begin to emphasize how far off the mark I was. I was happy that they agreed to work with me, sending me the Trifecta and Long Server. I was head over heels when the box came. I pulled them out of their wrapping, and they were smooth as butter. The Earlywood name is imprinted on each piece. Just holding them in your hand, you KNOW you've got a quality utensil that you will use pretty much every day. Keep in mind as I describe what I received that each of these utensils is available in each variety of wood. The ones I received came in each variety so I'll be explaining the ones I received. This Terra Scraper is made of Mexican Ebony. It looks black in the photo, but it's just a very dark wood. This piece that I received seems to have blond and red highlights. It's much heavier than you expect, and feels completely solid in your hand! At first I couldn't decide which utensil to use first. I was literally deciding on recipes based on the utensil. The Trifecta has the flat sauté, scraper, and spreader. I also received the Long Server. Where to start, where to start? I killed two birds with one stone by making a cheesy potato soup that called for bacon as a garnish. I cooked the bacon using the flat sauté. Can I just tell you, breaking these in was really hard simply for the fact they are all so pristine! 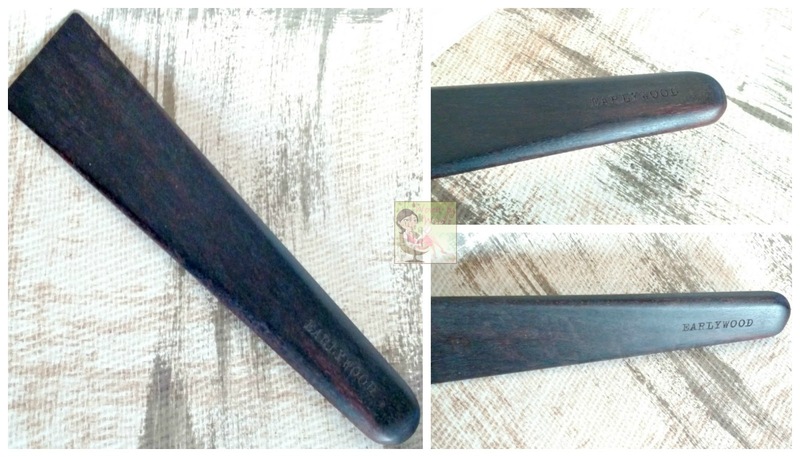 This utensil is made from the jatoba wood. This is going to probably be my go-to item of the kitchen. From there I made the cheesy soup. I used the long server through the sampling and scooping of the soup. 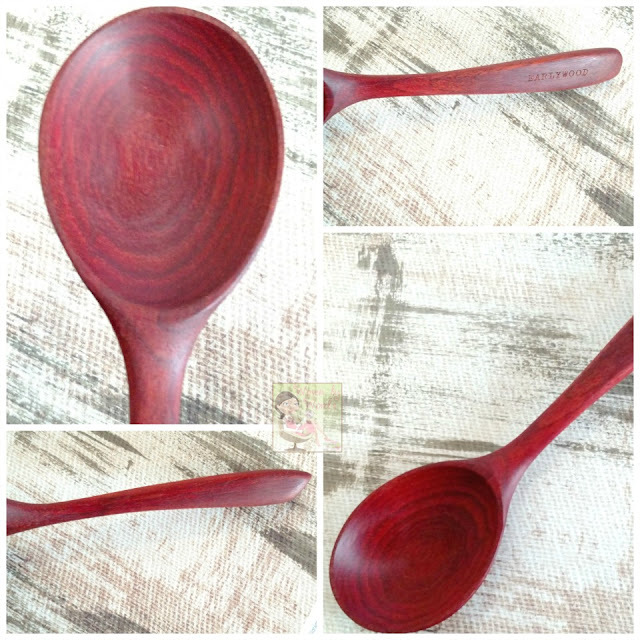 Don't you just love the color of the bloodwood? Whatever you do NOT tell Earlywood that I left it in water...Read their wood care page, and you'll find in every point they mention NOT leaving it in water. Shoot me now! Guess who won't be making that mistake again. I haven't had a chance to use the scraper or spreader. The spreader is a gorgeous hard maple. This handy little kitchen tool will probably be my most versatile one! Having only had these a couple of days, we've been going, going, going, I'll just have to keep planning on different uses to experience them all. I know they'll be part of our every day cooking. Getting rid of what we've been using all this time won't even make me bat an eyelash. Not only that, I've already started making a list of all the items I want to fill my kitchen. I'll have to slowly work Fred into my list because I could easily tell him to go to Earlywood, and just get me one of everything! I've already decided I'm going to get my brother the tasting spoons for Christmas. Yes, it's far away, but those are something he and Lora will love! Be sure to follow Earlywood on their social channels: Instagram, Facebook, and check out their Pinterest page. On Sunday, I'll be giving away a $50 gift certificate to their site, so you better start looking at what you want to win! What is your go-to kitchen tool? We love using wooden utensils in our kitchen. 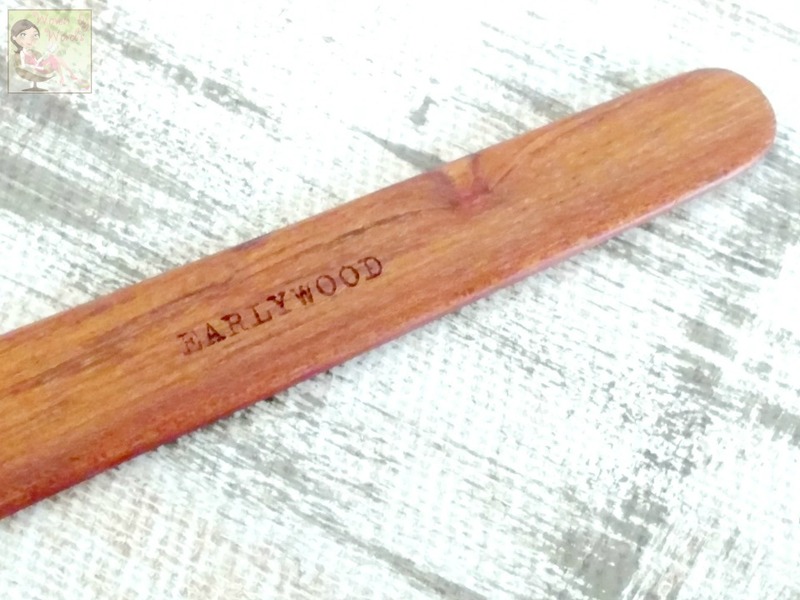 Not only do these Earlywood utensils look like good quaity, but they are beautiful as well. Those are beautiful kitchen tools. They would be a perfect gift for a foodie. Oh my heart, those spoons are gorgeous! They would totally rock in my kitchen! I love using wooden utensils when cooking. These pieces look great! Very beautiful. I have often wanted to toss it all and start again. Often! We can never have too many kitchen utensils. I love all of those different shades and varieties of wood available. I absolutely love the bloodwood color. So pretty and would look amazing in my kitchen! I love these!!! I use wood all the time to cook with it does such a great job and doesn't rip up my pans either. These bring some great character to the kitchen! Thanks for sharing! I love those! I really love all the colors too. I'm going to have to look at getting some of these for myself. These wooden utensils would make a great gift for my Sister. I love the look of the wood. I actually have some of the pieces from Earlywood! I love his attention to detail and his choice of wood. Gorgeous. These pieces look great. I love unique ones that bring some style to the kitchen! These are really gorgeous. I adore the colors, especially the red! I would love to use any of these products. I can't seem to find the right kitchen utensils but I know I would like the Terra Scraper. I understand I wouldn't know where to start either. These are so pretty even if they didn't have a function. I would feel like a kid on Christmas morning with a package from them! These are added to my wish list. these sound like great product. I would love to try them in my home. Well as I am a kitchen gadget collector and collect vintage and new too...I learned of his work a few months ago. And, am a fan of his quality wood products. Especially the large boards and the set of 4 minis. Gorgeous! I also love how he came up with the name of his company...perfect. Beautiful woods! I checked their site and love that Trifecta!